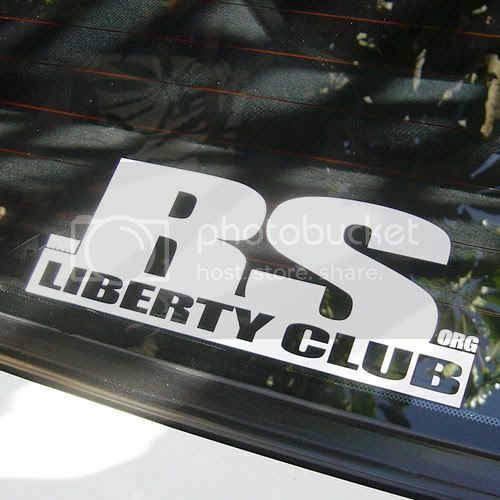 RSLibertyClub stickers are now in stock for sale. *note, www. and .org are not included. They can be sent them interstate/overseas if it is possible for people to send money orders or cash via the post. We'll get back to you with payment details. Once payment is received we'll send them off. Please don't PM or email me personally, only send to the above address. Last edited by bosc0; 5th April 2008 at 01:37 PM. If you have sent an email to the above address, can you please resend it as there were some technical difficulties. First batch of stickers were sent today to those of you that had paid prior to by yesterday. I would hope they will arrive prior to the weekend (aside from the one sent to the UK). If you have sent and email and not received a reply with payment details can you please resend it. EJ20G, VF29, 380cc injectors, stock heads, Stock RS ecu with 9 psi Vos chip, WAIC and upgraded inlet and zorst. All times are GMT +11. The time now is 03:41 PM.